Perfect for outdoor environments, Interior Illusions supplies expertly made folding arm awnings to offer optimal protection from the elements. Treated in weather-resistant coats of paint, our fold out awnings can withstand rainy conditions without rusting or showing signs of discolouration. The Interior Illusions team can help you choose a folding arm awning style that blends in seamlessly with your outdoor area. We stock a number of bracket options, colours and materials, all of which are built to stand the test of time. Being a local company, we know what it takes to manufacture awnings that can endure tough weather conditions. If you’re looking for a supplier of folding arm awnings in Melbourne, we’ve literally got you covered. 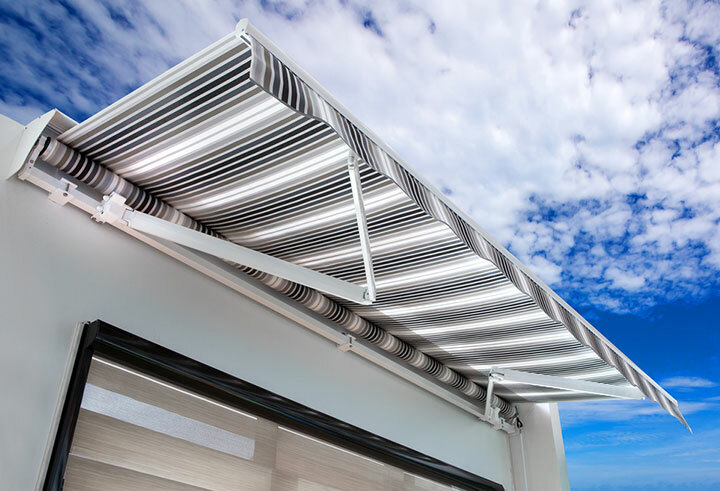 Folding arm awnings offer an easy solution to Melbourne’s unpredictable climate. They can help you enjoy the outdoors by blocking harsh UV rays and heavy rain, making your outdoor living spaces more versatile and accessible. Installing a retractable folding arm awning system means you won’t have to cancel your next BBQ because of bad weather. If conditions start to deteriorate, simply roll out your retractable folding arm awning to shelter your outdoor area. One of the greatest benefits of retractable folding arm awnings is how easy they are to operate. Motorisation will provide you with protection at the touch of a button, while easy-to-operate crank options are also available if you prefer manually operated designs. Why Buy Folding Arm Awnings from Interior Illusions? Interior Illusions understands the needs of our clients in Victoria better than an overseas supplier ever could. We’ll make sure your folding arm awnings are strong enough to handle everything from summer storms to frosty winters. Our team can complete the design and installation process quickly, even if you need a large number of awnings for a commercial building project. To speak with one of our expert consultants about fold out awnings, contact Interior Illusions today. You can also visit the Interior Illusions showroom to view our innovative product range in person.